This is a fabulous Art Deco musical jewellery box, made in the early 1930s. 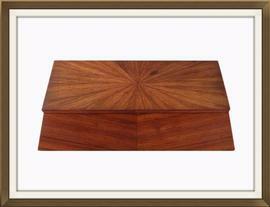 It has a wonderful angular form and is in excellent condition throughout. The lid is veneered with multiple pieces of wood which have been beautifully positioned to create a Sunburst effect. The front, back and sides are also veneered with larger pieces of wood. These have been skillfully cut and positioned, resulting in the grain creating a Chevron effect. 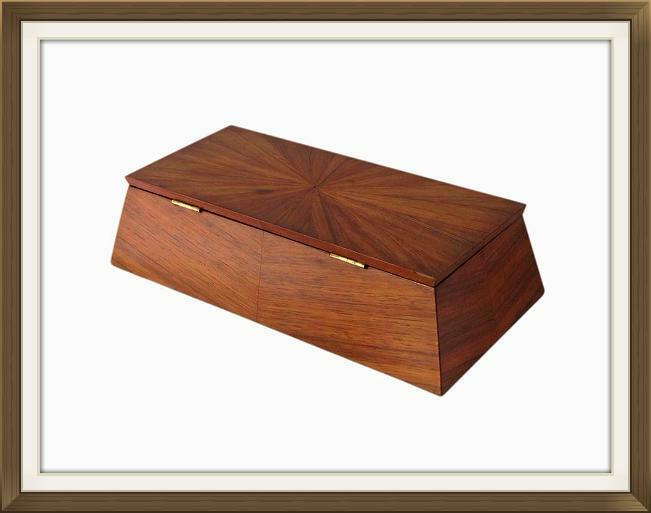 The box has a striking angular design which was very popular during the Art Deco period. Sunbursts and Chevrons were also popular during this period. 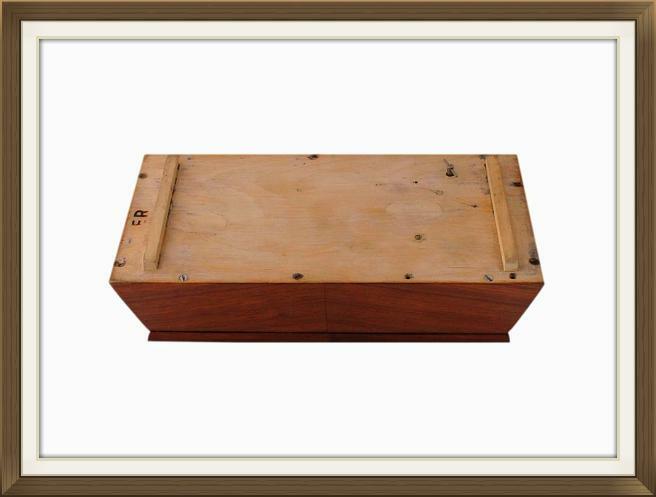 The box stands slightly raised on long block feet. The interior has a single storage compartment and the musical movement is cased to the left of this. The base of the compartment has a beautiful violet coloured velvet lining. The casing still has its original Reuge musical movement label. 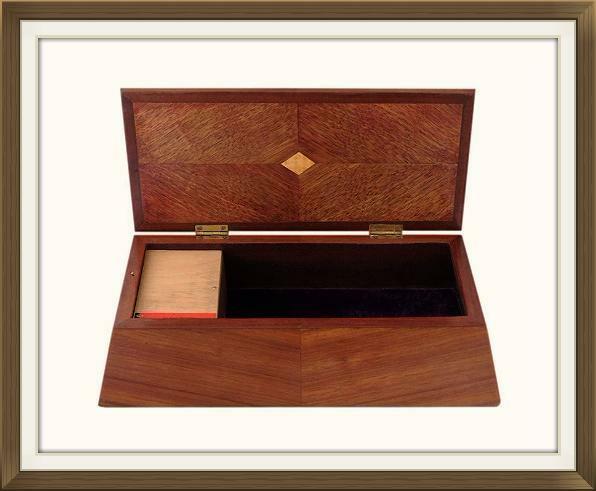 The inside of the lid has inlaid Tiger Oak panels and an inlaid Satinwood diamond. The Tiger Oak has beautiful characteristic stripes which is where the term 'Tiger' derived. The box is complete with its original brass hinges. The movement plays the beautiful tune 'The Blue Danube'. 5 turns of the key are sufficient to wind up the musical movement. The music stops as it should, when the lid is closed, or when the movement is fully unwound. As with all musical boxes, care should be taken not to over wind the key. Over winding will result in the movement malfunctioning. We would like to make you aware that vintage musical movements can suddenly malfunction at any time. They are already very old and will naturally have some wear from age and use. We are not responsible for movements that malfunction from further age and use, once boxes are purchased. Please check the movement is working as soon as your box arrives. You can view our full returns policy which includes musical movements, by visiting our Payments And Returns page. This wonderful box is in excellent condition despite its 80 plus years of age! It is structurally sound and has no cracks. There are two teeny slithers of veneer missing to the front and back edges of the lid. These are barely noticeable. The interior velvet lining is in excellent clean condition and has no splits or fraying. The musical movement and hinges are in perfect working order. 18.5 by 11.2cm with a 5.5cm depth. International postage is by Royal Mail International Tracked & Signed. Delivery is fast within 3-5 working days to Europe and 5-7 working days to the rest of the world.